Scioto County Habitat for Humanity began work in April on this new home on Longview in West Portsmouth. The organization plans to build a second home on an adjacent lot. Cristian Kuirasco (left) stands ready to help as construction of what will be his front porch continued Saturday. Volunteers helping out are Paul White, on the ladder, and Jim Klimer, Habitat construction manager. Scioto County Habitat for Humanity President John Dials instructs Lexy Kuirasco, 15, on the use of an electric drill. Lexy was lending a helping hand as construction continued on her family’s new home in West Portsmouth. Looking on is Cortney Collier, 16, who will be moving with her family into a different Habitat home. Cortney Collier, left, and Lexy Kuirasco walk down what will be a hallway in the Kuirasco’s new family home now under construction. “We’re just blessed we’re going to be here in a place to call home instead of just in a house,” said Yolanda Villeda-Kuirasco, who along with husband Cristian, is getting set to become a home owner courtesy of Scioto County Habitat for Humanity. Construction began in April on what will become the family’s new home, which should be finished in about a month or so. Before they move in, the family, which includes three children, will have put in hundreds of hours of “sweat equity” — time spent working on the place they’re going to call home. “It’s a hand up, not a handout,” says John Dials, quoting the motto of Habitat for Humanity. A volunteer with the organization for 10 years, Dials is the current president of the Scioto County Habitat for Humanity. “We don’t just give houses away,” Dials explains, adding there seems to be a common misconception that his group builds homes for free. Much of the labor that goes into building homes is donated, but every family that moved into one of the 14 homes built in Scioto County was, like the family helping piece together the latest home on Longview, part of the labor force that constructed those homes. And while it’s interest-free, there also is, in each case, a 30-year mortgage to pay. Home recipients all must meet eligibility requirements. They can never have declared bankruptcy and their income must fall in a certain range depending on the size of the family. Rebecca Collier started working with Habitat for Humanity about two years ago, she says. Collier was among the volunteers working on the Longview home Saturday morning. With the temperature pushing 80 degrees early on, Collier joked she was definitely putting in “sweat equity” on the home she and her two children will be taking over elsewhere in West Portsmouth by the end of the year. Collier figures she owes 250 hours of work for what will be her new home. Daughter Cortney, 16, was also among the volunteers at the Longview home on Saturday. “I’m just ready for a new start,” Collier declared. The Colliers and the Kuirasco family were joined that hot day by about 12 to 15 members of the International Brotherhood of Electrical Workers, Local 575, of Portsmouth. “These guys work five days a week, then they’re out here doing this on a Saturday. God bless them all,” Dials says. There were other volunteers as well. “We’re actually trying to be the hands and feet of Christ,” says Paul White, a past president of the county Habitat for Humanity. White was working on the home’s front porch along with volunteer Jim Klimer, a retired construction manager. Klimer explains that when he retired, he was just looking for something to do, and working for Habitat for Humanity seemed like a worthy idea. “It just seemed a good thing to do,” Klimer says. “That was it, I was hooked,” Dials concludes. The land on Longview was donated and Dials says his group merged three lots into two. The county Habitat for Humanity’s next project is another home next to what will be the Kuirasco home. While much, if not most, of the labor which goes into Habitat for Humanity homes is donated, the organization must purchase the raw materials, which are funded by yard sales and other small fundraisers throughout the year. But Dials wants to put in an early plug for the primary fundraiser, the annual Fall Ball/Harvest of Hope held each October. Dials says last year’s event raised about $20,000, or in his terms, about one-third of a house. “That’s kind of how I think about money now, in terms of how much house it will buy,” Dials jokes. 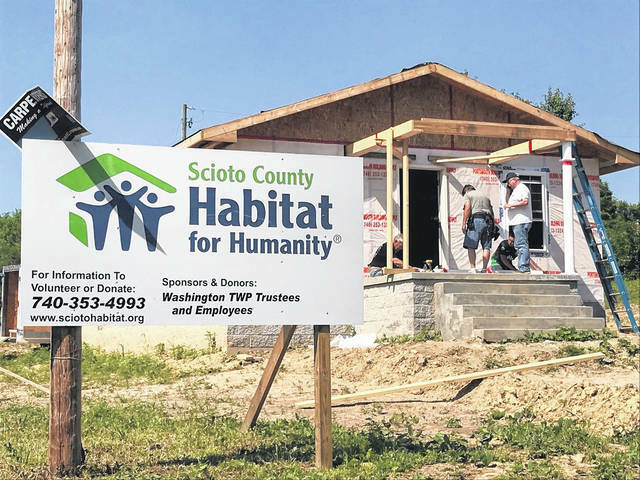 https://www.portsmouth-dailytimes.com/wp-content/uploads/sites/28/2018/06/web1_home-and-sign-a.jpgScioto County Habitat for Humanity began work in April on this new home on Longview in West Portsmouth. The organization plans to build a second home on an adjacent lot. 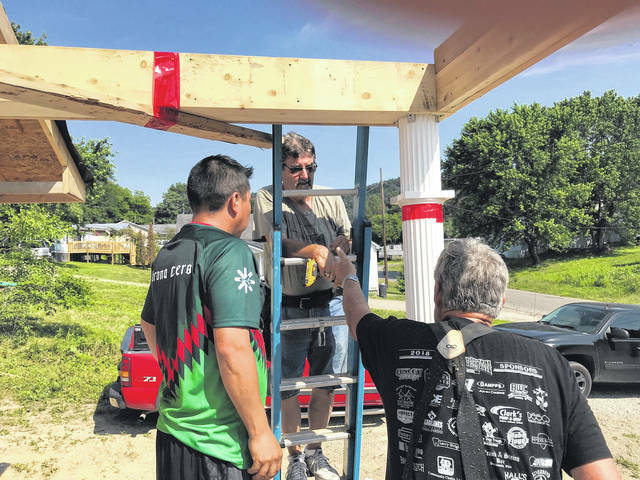 https://www.portsmouth-dailytimes.com/wp-content/uploads/sites/28/2018/06/web1_cristian-a.jpgCristian Kuirasco (left) stands ready to help as construction of what will be his front porch continued Saturday. Volunteers helping out are Paul White, on the ladder, and Jim Klimer, Habitat construction manager. 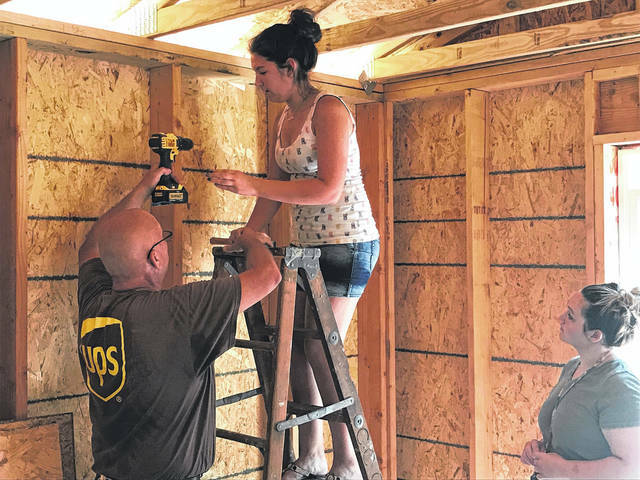 https://www.portsmouth-dailytimes.com/wp-content/uploads/sites/28/2018/06/web1_dials-and-girls-a.jpgScioto County Habitat for Humanity President John Dials instructs Lexy Kuirasco, 15, on the use of an electric drill. Lexy was lending a helping hand as construction continued on her family’s new home in West Portsmouth. Looking on is Cortney Collier, 16, who will be moving with her family into a different Habitat home. 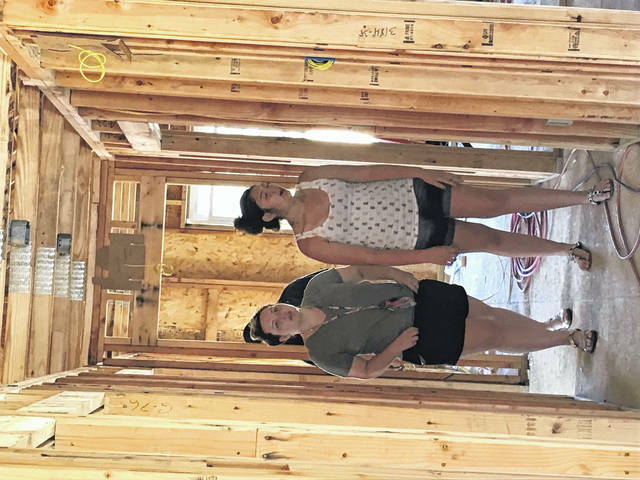 https://www.portsmouth-dailytimes.com/wp-content/uploads/sites/28/2018/06/web1_vertical-girls-a.jpgCortney Collier, left, and Lexy Kuirasco walk down what will be a hallway in the Kuirasco’s new family home now under construction.